Leave a comment to this post letting us know the Instant Messaging client(s) you use for your chance to win a FREE copy of IM+. 30 FREE Copies to be Won!! During the first few days of WES 2009 the folks from Shape Services launched their latest version of IM+. 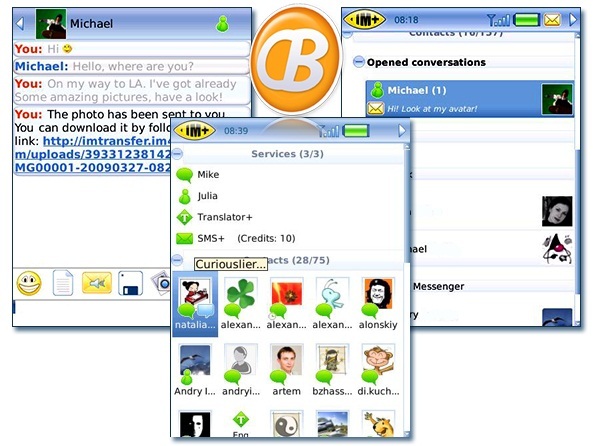 IM+ for those who may not know is an all in one messaging client with some great features that extend well beyond just the instant messaging world offering not only discounts on long distance SMS but also including some great translation tools as well. The list of IM clients supported by IM+ is ever growing from MSN and Yahoo all the way to MySpace, Facebook all of which include a service called "IM Push" so that your messages are pushed to your device much like you how your email is and even includes message list integration. Most recently IM+ has launced their new beta version 7.0.5 which has now included a extremely functional Twitter client as well as includes Skype chat and you all are invited to try it out and offer your feedback on how to make it better. Having used the application for the past few days on both my Bold and my Storm I have to say I'm throughly pleased with all the included features that come from the current version and can't wait to see the final release with Twitter integration finalized, in the meantime Shape services has given us 30 registration codes to give away to the CrackBerry nation. To enter, just leave a comment and let us know which instant messaging client you use mostly for your chance to win. Contest entry closes this Sunday at Midnight PST.